The Skagit River is about 2 hours northeast of Seattle. The river starts in Canada and it dumps into Ross Lake, which is near Seattle. The Skagit is well known for its tremendous fly-fishing of native Steelhead. People come here from the local area and from all over to see if they can hook into the monster Steelhead in this river. Some can be over 20 pounds. That will catch your attention. The Skagit plays host to many varieties of Salmon, as well as Dolly Varden Char and Cutthroat Trout. Hatchery Steelhead begin showing up in November with the native Steelhead just behind them. 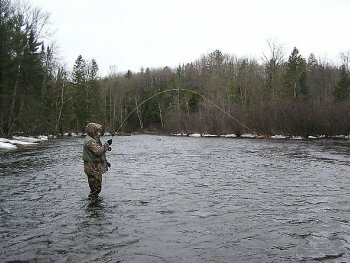 The Steelhead fishing is remarkable into April when the season comes to an end. This is not an ordinary trout fly fishing stream. These are large Steelhead that you fish for on this river. Catching one of these fish will provide you with future stories to tell your grand children. If you have never fished this river you should invest in a guided trip. They will increase your odds of finding and landing these large fish and they will also have the appropriate equipment in case you don't have it. The Skagit doesn't have to be a once in a lifetime experience, but it wont be easy to forget either! Here is a map of the Skagit area. Leave Skagit River and return to Washington page.